The Council of Ministers, chaired by Crown Prince Muhammad Bin Naif, Deputy Premier and Minister of Interior, held on Monday make major changes in Visa fees if exit reentry multiple entry transit visa, hajj and umrah visa but also amend penalties for Traffic Violations in Saudi Arabian Traffic Law. These New amendments in Traffic Laws includes huge amount of fines as well as closing vehicle to run on the road of Saudi Arabia. These amendments was take to control a major problem of Vehicle stunts which is really dangerous for driver as well for those who drive around. Cabinet also increases the tariff for those who want to rent billboards used in advertising. 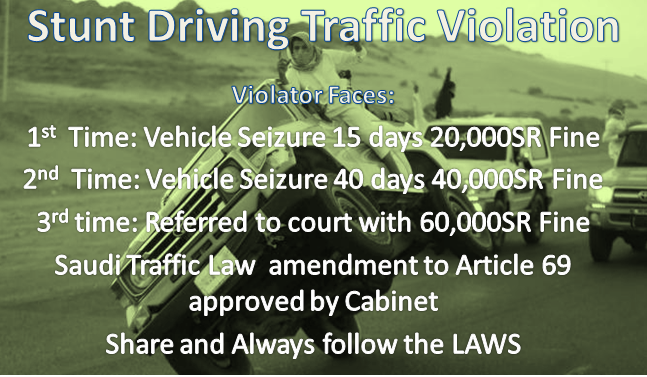 The Cabinet approved amendment to Article 69 of the Saudi Traffic Laws which make vehicle/car stunts a violation and violator face penalties for this act. 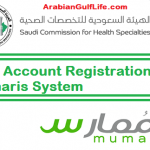 For first violation of the law violator faces seizure of vehicle for 15 days and 20,000 Saudi riyal fine for second time 30 days seizure of vehicle and 40,000 Saudi Riyal fine and for third time the fine will be 60,000 Saudi Riyal with violator referred to court where further decision will be made. In case the vehicle is stolen or rent from company the seizure will not imposed on vehicle only. Another Amendment in Article 68 of Saudi Traffic Law which shows that those driver involved in accident must stop at scene and must contact to local authorities in case if they run away the fine of maximum 10,000 Saudi Riyal Or 3 months of jail may be imposed. 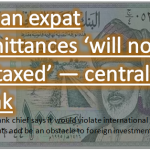 Article 70 amendment includes Any one who seizes the driving license / istimara of other people or gives it to mortgage(Debt) will face a fine minimum SR 1000 Saudi Riyal or a maximum of SR 2000 Saudi Riyals. 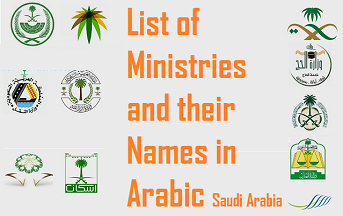 If you want to read other major decision make by Council of Ministers in which they approved revise visa fee than must read the story at NEW Visa Fees in Saudi Arabia. 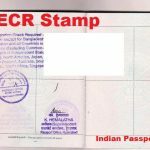 What Does ECR and ECNR Stands for in Indian Passports?